Basically they centered the wing in the fuselage and increased the wing tip height from 3" off the building surface to 4". They said, "This solved the turning problem, and the plane flies much better." ec121connie also..."added a blocking plate in the fuselage from the bottom of the swappable engine mount to the lower fuselage"... to counteract the..." large percentage of the generated thrust through the center section of the fuselage." This modification seems to improve..."The airplane's ability to answer the rudder". Welcome to the forum from a neighbor just up the road. I also have been out of it for over 42 yrs. and am just getting back in it also. I have built one pod with 2 - 3 degrees of both down and right thrust but haven't tried it out yet. I did the Old fogey and want to do the old speedster soon. I finally got mine in the air. Replaced the wheels with skis and took off of the snow. The left pull is overwhelming. Trimmed full right and with a low throttle I can almost get it to fly straight, but not usually for long. I think the extra left wing length in the plans is just too much. I'm going to try to center the wings as others have. Closing off the front of the fuselage may be worth a shot as well. I think I'll try those before I up the dihedral angle. 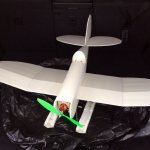 I just finished a scratch-built speedster including the long left wing per the plans. It is flyable, but it pulls left pretty hard. It trims level with about 10 degrees of right rudder. But that doesn't leave much rudder to make a right turn. I do not really want to try to move the wing because it will destroy the foam. I was thinking of adding some washers under the motor mount to add some right-thrust. Anyone try this? I too have been flying the speedster with skis. That part works really well. Pic of the skis,but before the new mods. Just foamboard, tape and hotglue. Front gear wire is FT kit music wire. The back set (just reversed) is clothes hanger. I managed to center the wings without damaging them too much. I was goofing around and used a piece of thin vinyl shelf covering to block the front. I probably would use posterboard on the next build. There is still a left pull. I really have to throttle up to get airborne, and keep the stick to the right even with right trim, but once in the air it was much better. There seems to be a throttle sweet-spot where the left pull starts to balance, and if nothing else, the lazy left circles were fun. I managed some decent touch-and-gos with the skis. Taxiing around was pretty fun once I got the feel for it. I'd still like to have more right stick, but in the few weeks I've been building and flying (just started at Christmas) this was my first time cleanly landing, so thats something. The Speedster I'm building is slightly modified. I raised the wing up about 1 in and trimmed about the same from the bottom to give it a more sleek appearance and moved the wheels closer to the fuselage. I'm building it out of Elmers yellow foamboard to give it some basic color. I'm using a Hacker A20-6XL from an old heli with a Phoenix ESC with a Spectrum DX-5e. It weighs about 22 oz. as built as the Elmers board is a bit heavier. I'm not quite finished, but will post some pictures when done. 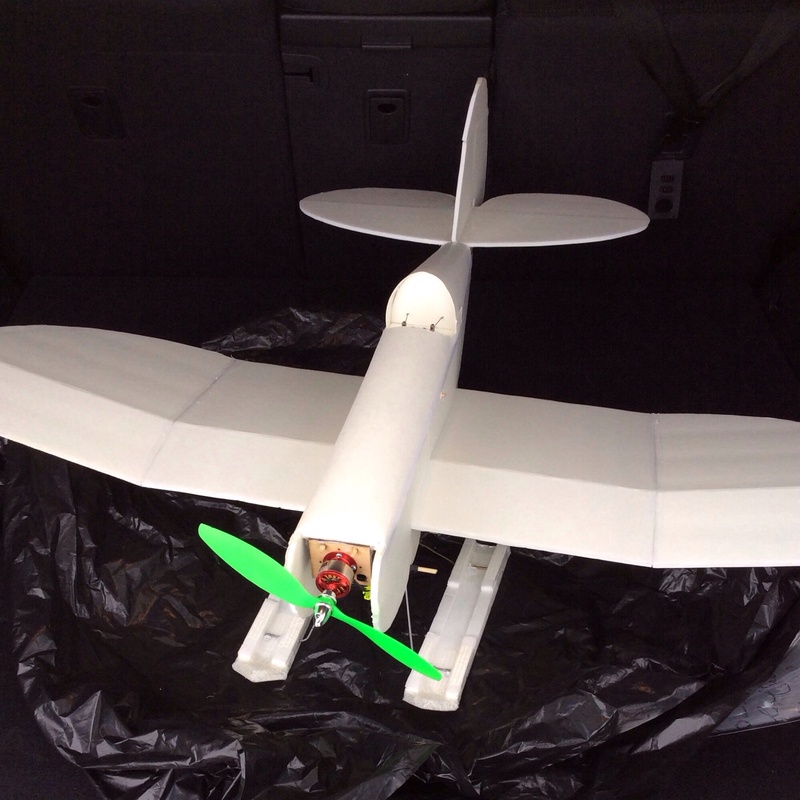 It has been very windy due to some recent bad weather, so I don't know when I will be able to maiden it anyway. There is still a left pull. I really have to throttle up to get airborne, and keep the stick to the right even with right trim, but once in the air it was much better. There seems to be a throttle sweet-spot where the left pull starts to balance, and if nothing else, the lazy left circles were fun. I've been wracking my brain to figure out how to remedy this. My FT Flyer does much the same,but to a lesser degree. I guess I will have to do the same to the Speedster. Also of note, I notice that the Fogey does not seem to exhibit this tendency. I think it may have something to do with the placement of the wing in relation to the motor thrust-line. The Fogey's wing is high above the motor and all the weight is below the wing. Even the Flyer's wing is above the motor thrust-line, just. I seem to remember hearing that this's what makes high wing planes more stable than low wing planes. Bill with the heaver plane you should be able to fly in higher winds but you may also need more power than called for. We never seem to get below 10 mph here unless it is just plain to cold to fly or after dark, but now with the nicer weather I hope to get some morning or late afternoon time in but like today it was 15 - 20 mph all day long, to windy even for a heavier plane. We will both have our day. I did not know how much heavier it would be when I bought the Speedster power kit from Lazertoyz. Preliminary weight for right now is right at 20 oz. That's the reason for the Hacker A20-6XL motor. I'm not sure the Blue Wonder motor will be powerful enough. I have not decided what prop to use with the Hacker motor. I could not find any prop recommendations for this motor as it is listed primarily for helis. I have a APC 8 x 3.8 that I bought locally for it now. I will just have to experiment. Use a piece of foam board and shape it the same as the rudder. Take the paper off of one side and sand it to make a wedge shape so it is about 1/8" thick at the rear. Use 3 tooth pics to hold it onto the right hand side of the rudder just temporarily and see if that will help with the hard left pull. What I am thinking is like we used to build in right hand pull on our control line planes so they would pull the lines taunt. We also added right thrust to them but I think this is all that would be needed. I haven't built the speedster as I have said but it seems that this might work and if not there would be just 3 tooth pic holes to cover up. I like the paint job on the big one. Cant wait to hear how the little one flies. What motor is that you are running? I recommend building one up if you have the time- seems to be sized for smaller indoor spaces now! Sorry to quote myself, but I wanted to give an update. My speedster is now flying really well. Once you get it dialed in, it is a very nice plane. This plane flies best at just less than half throttle. So it takes some mental adjustment to get used to the slow and easy-going flying characteristics. Also, I have found that I don't enjoy flying it in any wind greater than 3-4 mph. At dusk with light wind the speedster is almost hypnotic to fly. Very slow and easy. Here is what I did to get mine flying right. I kept the long left wing as is. I added the blocking plate to the front using poster board. The plate covers from the firewall all the way down to the landing gear support. I glued the plate just at the top and used velcro at the bottom so that I could still easily access the battery area. Works great. With the blocking plate, the rudder feels a lot more responsive. Plus it looks better. Also, I had noticed that my horizontal stab had a bit of a twist. So I used a blow dryer to straighten it out. My speedster still needs a few clicks of right rudder to trim level, but I think it is acceptable. It turns fine both directions. I might still warp the wings a bit or add a little right-thrust to the motor. Or perhaps a small trim tab. 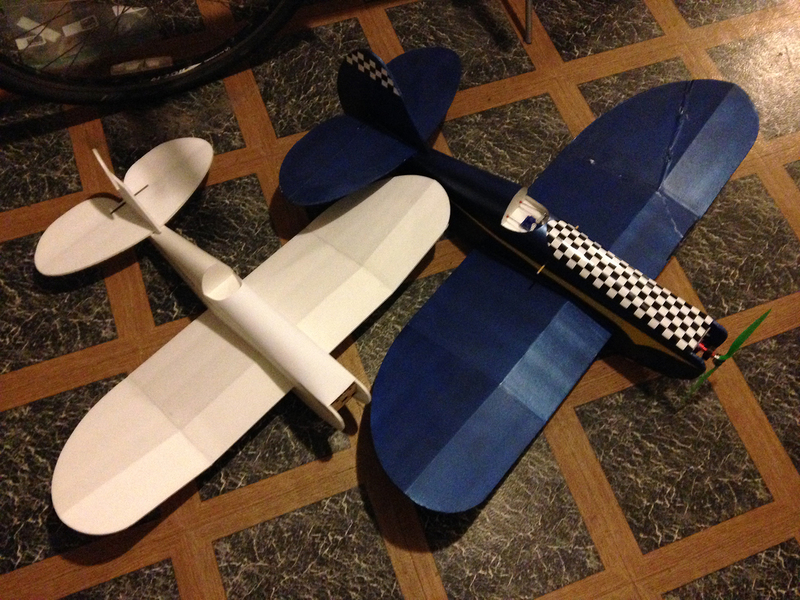 Just as reference, I am using a blue wonder, 9x47 slow flyer prop, and 1300 3S battery. I have the battery pretty far back to get the CG right. I have no idea what the AUP is, but I tried to build especially light. I'm glad you've solved the left turn tendency and found a happy medium. I also think your blocking plate idea is simple and efficient. I'm going to use it. 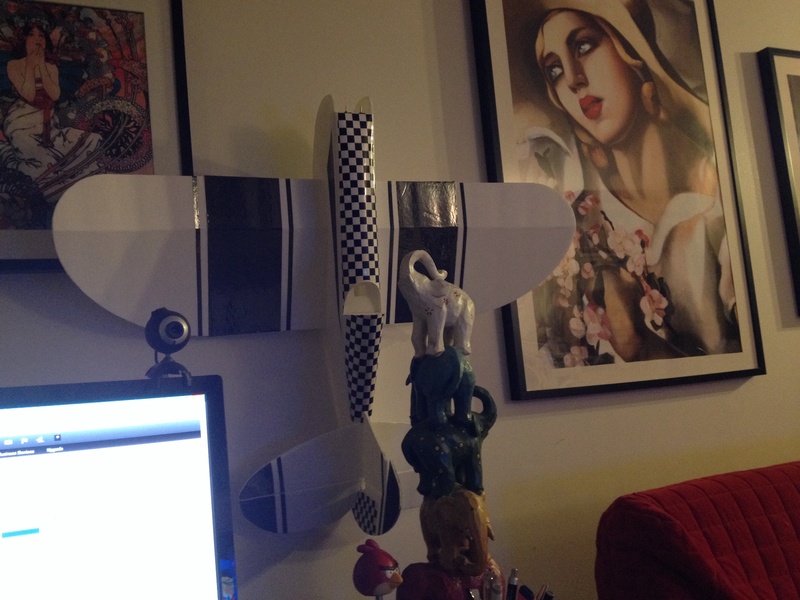 I have built-in some right thrust as well by mounting my pod off center in the fuselage. It mounts as normal, with the pods rear tabs. I have the pod pushed all the way to the right in the front so the firewall touches the right fuse side. I think it adds 2 1/2 degrees of offset. I'm going to use a 2212-13, 1100Kv motor and 9x4.7 prop. I'm hoping the lower motor speed will help as well. Great tip on offset, I've been looking for something like that. My motor mount is round so would be hard to put some offset in.